Lotus, a lonely girl who cannot speak, lives with her grandfather. After a beautiful crane is injured near the shore of a nearby lake, Lotus rescues him. She and her grandfather nurse the bird, which she names Feather. Gradually recovering, Feather follows Lotus to school, where he helps her connect with the other children. Because a wild creature must heed the call of migration, when Feather is strong enough, he joins a flock flying north. But a stunning finale shows the crane's return, his family and hundreds of cranes descending upon the water near Lotus' home. VERDICT Elegant storytelling and arresting compositions combine for a deeply satisfying emotional and aesthetic experience. Best shared one-on-one or in a small group so that children can pore over the lively and engaging artwork. Downing's finely crafted illustrations perfectly complement this reassuring story. Done with watercolor, pencil, and paint and digitally collated, they have the look of Chinese paintings, with misty backgrounds and gently bending reeds. The rosy-cheeked children wear red scarves, alluding to the author's own childhood during the Cultural Revolution. The crane's many graceful poses are beautifully conveyed, seasons change, and the backgrounds lighten from gray to a celebratory rose. The environmental message, Grandpa's explanation that "greedy fishermen and hunters, and … ignorant people…took over land where animals once lived," is slightly contradicted by the satisfying ending when the cranes return, but it may resonate. Gracefully told and illustrated, a gentle, positive encounter with a beautiful bird in an unfamiliar world. 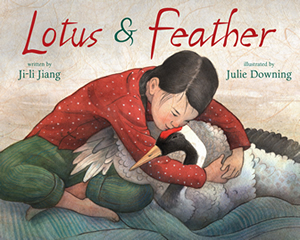 The author of Red Kite, Blue Kite (2013) and Red Scarf Girl (1997), Jiang offers a beguiling story of animal rescue in which Lotus and Feather form a bond, each befriending and helping to heal the other. Created using digitally combined watercolor, ink, and other traditional materials, the illustrations portray Asian characters within a number of lovely, fluid landscapes and warm interior scenes. A satisfying addition to picture-book collections.